I won’t lie. I often struggle to finish things I start. Just last week, I got around to completing a scrapbook of our South Africa trip from 2+ years ago. I’m still dragging my feet to put a wedding album together. 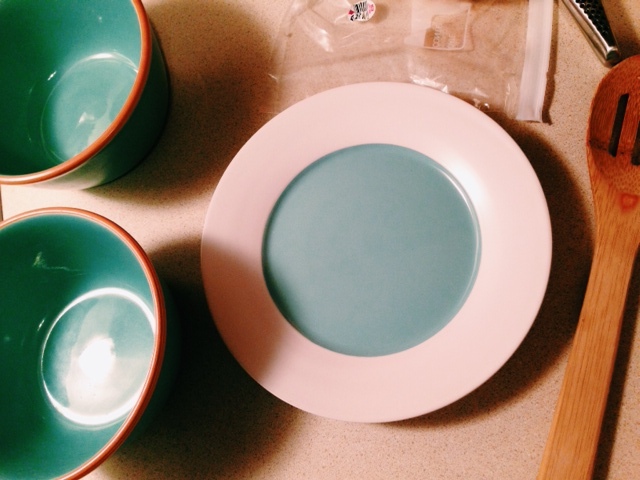 That dining set makeover from last fall was my game-changer in the world of Get Your Projects Done Already. But so far, 2015 has graced me with this ability in the much more relaxed world of reading. And because I’ve directed all my free time to these books, I thought I’d share what I’m loving right now. Maybe you’ll love them, too? Recommended to me by Mom, this was a foodie book – lots of talk of cheese and spices and lengthy meal descriptions (not complaining). The language is elegant and rich, yet playful, and the book blends stories from present day New York City with Midwestern tales of World War II. A thoughtful and charming read. Thomas gave me this cookbook for Christmas, and I proceeded to read it for a week straight, much like a novel. Ashley writes at Not Without Salt, and the woman has so much skill in pairing flavors, not to mention her stunning photography. The recipes are slightly more adventurous than what I’m used to cooking, which I believe is a good thing. I’ve already tried a handful and may have found a second love in the tarragon aioli. The recipes are divided first into four seasons, then broken down into date night menus that include a cocktail or drink, appetizer or side, main dish and dessert. 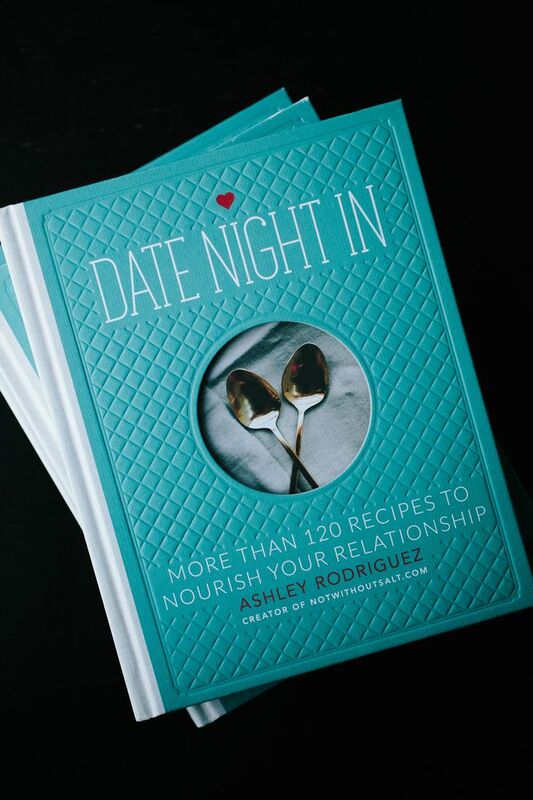 Ashley also gives an introduction to the menu based on her own date nights in. “Together we are eclectic, introspective, creative, and funny – basically one hell of a person. A decade into this thing called marriage, I no longer wish for Gabe to be different, or more like me. Instead, I’m able to see the very reason why we are a team. Our differences attracted me to Gabe, drove me absolutely crazy, and made us strong. Gabe and I are soul mates, but we worked damn hard to get here” (p. 37). This book is special, and I’m marking it up with joy. My sister gave me this one, also for Christmas. The Nester is not a DIY blog, but Myquillyn instead focuses on loving your home in its imperfections – not waiting for the next house to be the dream house. It’s filled with practical tips (like where to save and where to splurge), but the greatest value of this book is its reminder of why we create inviting spaces and rooms in the first place. “I always apologized for my home to protect myself so people wouldn’t think I was a slob, or at least so they would know that I acknowledge I can be a slob and that I’m not okay with it and that really I have much higher standards than this and my house does not meet my requirements. But that day, I realized that when I apologize for my home, I’m declaring to all within earshot that I’m not content. That I’m silently keeping score. That I put great importance on the appearance of my home and maybe, just maybe, I’m doing that when I visit your home, too. “Don’t apologize for what you have. It makes guests feel uncomfortable, it encourages discontentment, and if you’re married and your husband hears you apologizing for what he’s provided, it could be hurtful” (p. 61). Buy a plant. If it dies, that’s okay. Buy another kind of plant until you find one that lives (p. 193). For the love of all that is lovely, don’t be afraid to make a nail hole (p. 82). Live in and enjoy your space. Don’t fret when something breaks or gets scratched, because that is a sign of a life well lived. Yippie, you are doing it right! (p. 194). This book. I heard about this bestseller probably a year ago, picked it up for cheap at the bookstore and flew through it. The story is pieced together by emails and letters interwoven with narrative and dialogue. 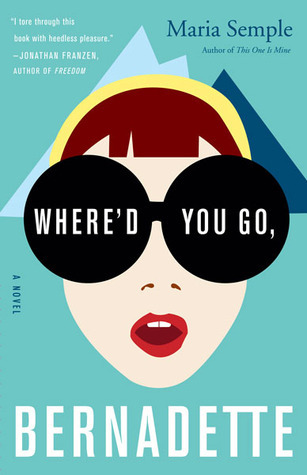 It centers on a mother-daughter relationship (that, of course, has its dysfunctions) and had me laughing out loud at 7:00 in the morning and 10:00 at night. It has a ton of wit and soul, even in the serious parts. Loved. Again, another Christmas cookbook. It’s written by Norwegian Sweet Paul, namesake of the quarterly print magazine. Flipping through, the book is filled with recipes, many of which will push my tastes (again), and kitchen crafts, like jam jar salt and pepper shakers and coffee filter paper flowers. I’m excited to really dig into this one. I can’t get away from non-fiction for long, can I? I discovered Tsh through her podcast, found here. The tagline of the book is “The Art of Living Intentionally in a Chaotic World,” and it centers on living consciously by way of small choices that make up a life. I’m like a sponge with these kind of books; should be a good one with many wise words. Side Note: A few weeks back, I wrote about our transition to a new city, a new home with new coffee shops and schedules and one-way streets to memorize. This season, despite its tough moments, is doing a lot in my soul. These books have undoubtedly helped me make space in my brain and heart for both wisdom and whimsy. Words change us, you know? 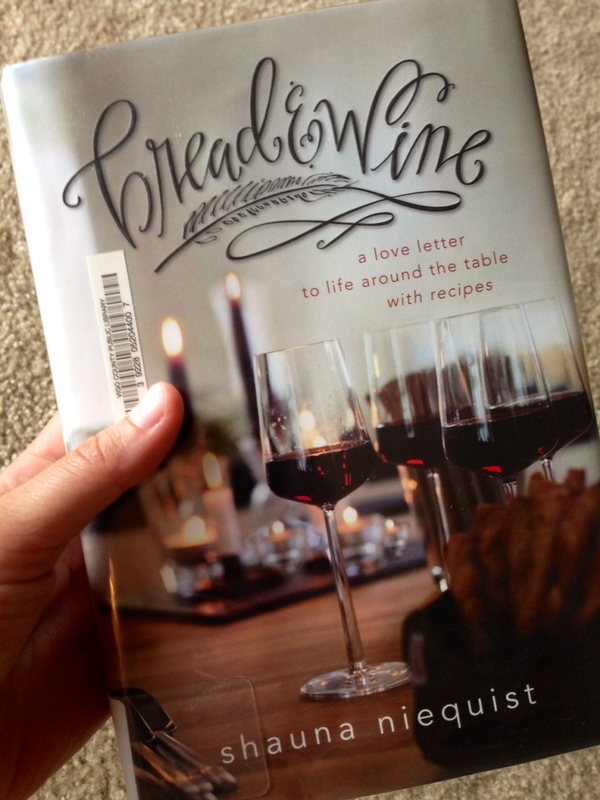 I just finished a book called Bread & Wine by Shauna Niequist. I was breathing in the words, becoming engulfed by this book to an obnoxious extent, where I finally started prefacing my statements to Thomas with “I’m sorry I keep talking about this book, but…” Finishing it last week was a sad day. Written in a memoir style, Bread & Wine is about the connection that happens around the table, over food. Shauna recounts recipes that take her back to her childhood, like blueberry crisp. She talks about what her friends (and their famous dishes) mean to her and how she’s learning to maintain a healthy perspective about feasting and fasting. And she includes all the recipes, so it’s pretty much a memoir/cookbook combined, and I was in heaven. In the book, she emphasizes how she feels the most joy and experiences God most clearly when she cooks for people, when they sit around her table and linger. The company, the nourishment, the flavor – all of it combined makes her feel alive. It made me think about our current dining room situation. On the rare occasions that we do have friends over for dinner, we sit at the table…with two patio chairs and the office chair on wheels. We have yet to purchase dining chairs. Call us cheap or lazy (or maybe both), but we just haven’t. So most meals are eaten on the couch. There’s nothing wrong with that. My brother offered us his dining chairs because he and his wife eat at the coffee table every night. We might do that, too…if we had a coffee table (see last sentence of the previous paragraph). But for now, we practice the art form of balancing plates on the couch’s arm rests, hoping the salsa doesn’t go rogue and passing drinks back and forth, all while we watch the news, or a cooking show, or maybe Netflix. Like I said: art form. We’re not unfamiliar with sitting around the table. I have many memories of my family eating dinner together, first at a somewhat rickety, wooden table in the kitchen with a long bench, perfect for sharing (read: invading) people’s space. I remember bickering with my brother and convincing Mom to let me have chocolate milk because I despised the plain stuff on its own. Then we had to move to a larger dining table when the family began to grow…boyfriends and wives and now grandkids who are phasing out the airplane-in-mouth technique. Growing still. Just last week on vacation, we still took up too much space in the condo dining room, and two had to sit at the counter. But still, there’s something special about being all together and having to wait your turn to be passed the salad. Tonight was particularly tricky for us, though, with grilled chicken and long stalks of asparagus. The couch wasn’t going to cut it, so we cleared the half-open pieces of mail and car keys and books to the other side of our round table (where our patio chairs were not), dusted off the surface, and ate there. It wasn’t revolutionary or anything. But we looked at each other more. We asked more questions. The Barefoot Contessa and Brian Williams weren’t distracting me. And even though we sat low in those patio chairs, I really enjoyed myself. I’m not sure I believe there’s some magic in sitting at a table. 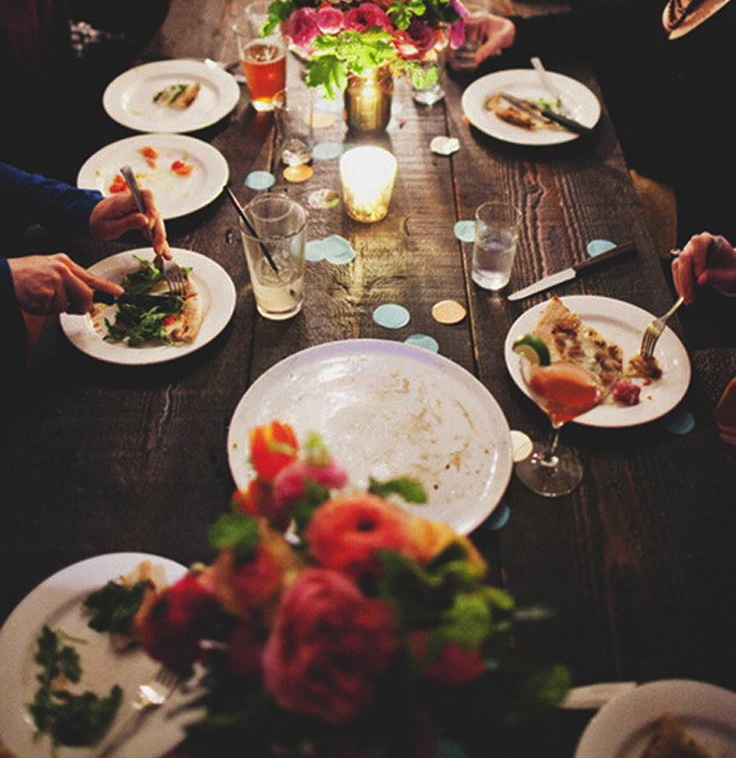 Community and conversation and hospitality can happen at the table, on the couch, or on a blanket in the grass. Maybe the key is about our focus. We who cook spend a good chunk of time on the meal, so we might as well be focused enough to really savor it – and appreciate who we’re with. When I think about the first house we’ll own, I dream of having a big table outside that can seat at least eight, maybe ten. We will string up twinkle lights overhead and offer much dessert to make people feel glad they came. But for now, I’ll start perusing Craigslist for regular dining chairs to occupy our table meant for four. Patio chairs were meant for patios. A funny thing happens when you move out. All of a sudden, Mom’s not there to make a full meal every night consisting of a protein, starch and green veggie. Someone has to do it. And by that I really mean get dinner on the table, green veggie or not. The kitchen is one room in the house I really take ownership of. The guest bedroom is extremely unorganized, my bedside table is a wreck, but my kitchen actually makes sense. I’m thankful that cooking and baking are not burdensome. I enjoy both, as long as I have time to do so and don’t feel rushed. Lately it’s become even more clear to me why I cook and why I bake. So here it is, my kitchen manifesto. Or something like that. I cook because I love to eat. Bacon, potatoes, brussels sprouts, rice, cheese, pasta, chicken and wine. Good white wine. Rolls, kale, pizza, brownies, muffins. You get it. And if I don’t have the budget to get these things at restaurants (I don’t) then we need an alternative. Cooking is the alternative. I cook for the pride of making something really delicious. When I look at my pretty plate of food, or have onions sautéing on one burner, sauce simmering on another and who knows what in the oven, there is something magical about it all coming together. And when it happens to come together at the same time, it’s pure glory. I cook because it keeps me humble. I’ve made beer bread that was terrible, and some ultra healthy zucchini bread that was even more so. Rolls have turned out tasting too much like yeast and muffins come out too bland. Chicken underdone. Noodles too soggy. It teaches me that I have so much to learn. I cook for Thomas. Because he can do better than frozen pizza and buttered noodles, dang it. I cook as a creative outlet. Monday through Friday, much of my time is spent on the laptop. Evenings and weekends roll around, and I tend to unplug. Kneading dough for pizza tonight felt so great because I could touch it, mold it how I wanted. Finding external ways to express creativity is healthy. I cook for tradition and to carry on the recipes that both my mom and mother-in-law hold so dear to them. From breakfast casserole to cinnamon rolls to brown sugar thighs, these recipes are worth sharing. Plus, it gives us something to talk about when we’re together. I cook to share love. And joy. And goodness. Because a tasty bite can instantly provoke feelings of peace and satisfaction. One good dish may not save the world, but it can change how we view the world and our own problems, even if it’s for a mere moment. Your hobby, or maybe just whatever you do day-to-day, matters. It really matters. What you cook, play, study, teach or sell, these things are important things, and to identify why we do them can be reassuring. Sometimes we do them for the wrong reasons…because we feel like we have to or the world would fall apart if we didn’t. And other times we do them because we just plain like it. Whatever you do, I hope it brings you some kind of goodness.